The Institute for Advanced Jesuit Studies is pleased to inaugurate Jesuit Studies Café, a new series of informal conversations with the world’s preeminent scholars working on the history, spirituality, and educational heritage of the Society of Jesus. 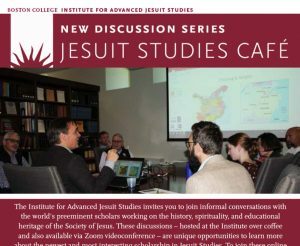 These discussions – hosted at the Institute over coffee and also available via Zoom video-conference – are unique opportunities to learn more about the newest and most interesting scholarship in Jesuit Studies. The Jesuit Studies Café discussion series is free and open to the public, either in person or online. Please complete this form to participate in the discussions. To join these online discussions, to find out how to lead one of these discussions, and for additional details, please contact the Institute (iajs@bc.edu).